Boardwalk toilet paper is soft, and eco-friendly. Our line of Boardwalk BWK6145 2-Ply Standard Toilet Paper is the perfect choice for any lavatory. Safe for sewer and septic systems, this soft white toilet paper is a reliable, economical option for any location. Boardwalk toilet paper meets EPA guidelines, with 65% post-consumer waste and 35% pre-consumer waste fiber. The individually wrapped rolls make Boardwalk brand a more hygienic choice. 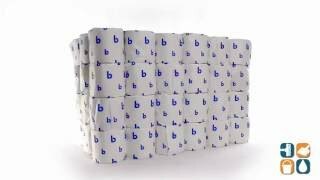 This toilet tissue is a great economical alternative to more expensive name brands and the perfect choice for offices, schools and commercial facilities. 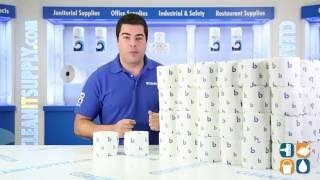 Buy this 2 ply toilet paper pack of 96 rolls for your home or office at wholesale prices here at CleanItSupply.com! The quality of this product is very good. It isn't a super luxury brand and still is a good product. Decent size rolls of toilet paper at a very good price. product is used frequently, i'm completely satisfied with the overall product ,and as a result, will continue to be a loyal customer. We use this product at a 5-screen movie theatre. We are satisfied with the product, and we continue to order it from CleanItSupply.com. Recommend to anyone in the commercial business. Great product! Great toliet paper for the price! Product is a great value. As a multiplex theatre, in a relatively small town, we a very busy most of the time, and we go through a LOT of toilet paper. The type that we were using before was rough and only single ply. I think that people were using so much of it because of that, but now that we have this type they don't have to! It's soft, plush, and honestly feels like heaven. =D It comes off the roll nicely and doesn't feel like tree bark. I purchased paper towels and toilet tissue. Quality is exactly what I expected. For the price, it's great. I would recommend the product to child care centers, schools, churches, and businesses that accommodate a high number of employees and/or clients. Great quality and prices. I love the large cases that are available. I never run out of toilet paper. I even repurpose the paper wrap, too. It makes wonderful packing material for my home business use. Product is more than satisfactory. However, the box was taped with a gap in the top. Therefore, tape was placed on the packaging around the toilet paper. We had to remove the protective wrapping prior to using. We use the paper for our commercial cleaning clients.